In large bowl, break up cookie dough. Stir or knead in flour until well blended. Reshape into log; separate into 2 halves. Wrap in plastic wrap. Place in freezer about 30 minutes or until very firm. Heat oven to 350°F. Line cookie sheet with parchment paper. Cut half of cookie dough into 16 slices. On cookie sheet, arrange 15 slices, 1/4 inch apart, in shape of mitten. (See diagram.) Roll remaining slice of dough into log; place on side of mitten; flatten to form oblong shape for thumb. Bake 8 to 11 minutes or until golden brown. Remove parchment paper with cookie from cookie sheet. Cool completely, about 15 minutes. Remove paper from cookie. Reserve 1/2 cup frosting. Divide remaining 1/2 cup frosting into 3 small bowls. Add different food color to each bowl; blend well. Place each colored frosting in small resealable food storage plastic bag. Cut small hole in bottom corner of each bag. 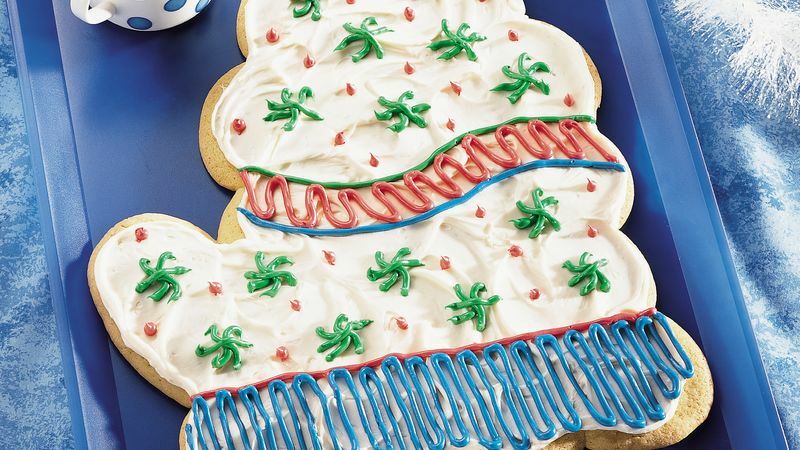 Spread reserved white frosting evenly over cooled cookie. Pipe colored frostings into decorative pattern on mitten. Cut cookie into pieces.